Have an Exciting Food Fight With This Addicting Puzzle Game! Who says playing with your food is a bad thing? In Papa Pear Saga, playing with food is actively encouraged by the food itself. Take aim and fire! Each level is a new colorful board full of objects to interact with. Unlike most puzzle games, Papa Pear is located at the top of your screen. You will aim and fire the pear downwards. This gives Papa Pear Saga an unusual feel that differentiates it from other puzzle games. As Papa Pear comes in contact with obstacles on the board, actions will be triggered. Most objects disappear on first contact, but others take a few hits. You earn points for clearing items from the board. You are in control of Papa Pear’s trajectory at launch. Your goal is to launch him on a flight path that will lead to the most fruitful collisions on the game board. Learning how to manage the pear’s trajectory isn't easy, and this adds some rewarding challenge to this otherwise relaxing and casual game. You can have up to three Papa Pears on the board at one time, and this can make for some very fast paced gameplay. Papa Pear Saga is unique in its use of gravity too. Because Papa Pear is launched from the top of the screen, it really gives you a sense of gravity as he falls and bounces down to the waiting buckets below. Each level has its own requirements for passing. Some are based on points. Others are based on achieving specific goals during the round. This adds awesome variety to the stages. The world of Papa Pear Saga is vibrant, color rich and lively. 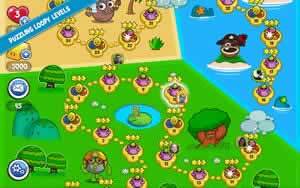 The trees, clouds, acorns and more are all anthropomorphic, smiling happily as if they’re totally content just to be with you as you play the game. Papa Pear Saga is also full of zany sound effects. Things squeak and squawk when hit. Peppy fiesta music plays during the levels and at the title screen. In short, the world of Papa Pear Saga is just a fun and joyful place to be. The names of the regions in this game are fanciful and fun as well. Work your way through the Fruity Forest to the Pirates of the Pearibbean and beyond. Go head to head with your friends! If you happen to best the scores of a friend, Papa Pear Saga will give you the option to let them know about their defeat. In addition to bragging, the social integration also enables you and your friends to help each other as well. A good rivalry is a great incentive to rack up those points. Papa Pear Saga is absolutely free to play. There are optional boosters that you may purchase if desired, but they are not required to advance in the game. 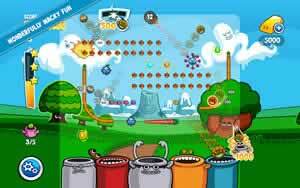 Papa Pear Saga is a zany puzzle game that offers hours of exciting gameplay. It’s a must play for any puzzle fan.